Home > Cyber > New Year, New Social Media Challenge Risks? Social media users are generating millions of publicly shared photos comparing themselves in 2009 and 2019. In addition to generating likes and comments on posts, the popular “10 Year Challenge”, most prominently featured on Facebook, is also providing social networking companies and researchers organized data sets regarding what you looked like ten years ago and what you look like now. The challenge offers insight into how our personal data can be solicited and used against social media users. Kate O’Neil, founder of KO Insights, tweeted her response to the challenge bringing up similar concerns and found it resonated with other social media users. In her recent opinion piece on Wired.com O’Neil expresses the need for the public’s heightened awareness of the implications of sharing something as seemingly innocent as a meme. While companies like Facebook, Twitter, and Instagram scrub data from images once they’ve been uploaded to their sites, the initial metadata they receive from uploaded photos is always available to them. In other words, Facebook has access to details from your photo including geo coordinates, time of capture, location/time of posting, and much more. 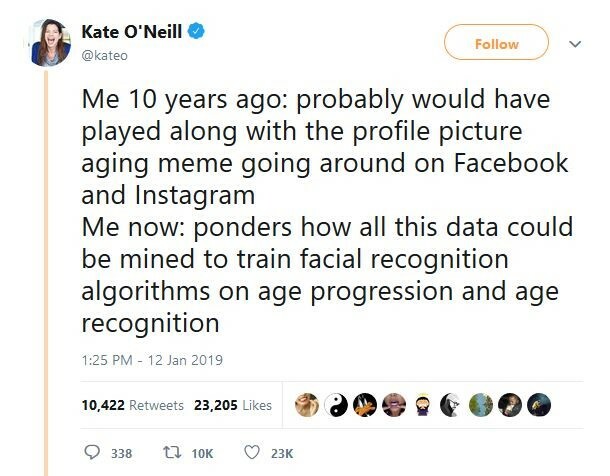 O’Neil’s concern is a valid one: that data mined from posts like these memes could be used to train facial recognition algorithms on age progression and recognition.